Celebrate the beauty of the great outdoors in South Carolina. From pristine, white-sand beaches in the Lowcountry to majestic mountains in the Upstate, natural wonders abound in South Carolina. Experience the beauty of the great outdoors like never before in South Carolina. South Carolina's diverse landscape offers the perfect backdrop for adventure. Whether you uncover hidden waterfalls in the Upstate or explore the lush gardens of the Lowcountry, you're sure to create picture-perfect memories in the Palmetto State. Hunt for treasure in the great outdoors of South Carolina on a geocaching adventure that’s fun for the whole family. Use GPS technology to search for hidden containers as you explore the Palmetto State from the mountains to the sea! 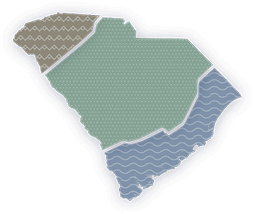 Check our South Carolina events calendar to keep up with more than 3,000 annual events. Plan your next getaway around upcoming South Carolina fairs, festivals and unique cultural experiences. Hike to altitudes of 1,400 feet through the Blue Ridge Escarpment on the Palmetto Trail’s breathtaking Blue Wall. Experience SC's coastline on a fishing adventure for the entire family. Learn how to fish the old-fashioned way from one of our fishing piers on a family vacation not soon forgotten.